Welcome to the #SparkEmpathy chat. Empathy is the capacity to understand what another person is experiencing from within their frame of reference. To develop it, we need to first get to know people in different situations, then we learn about the HOWs and WHYs. The WHYs lead us to empathy. Assisting students to #SparkEmpathy is a lifeskill; a 21st century skill through communication, collaboration and problem solving. We discussed ways that we can help our students become more empathetic. The questions came from the guest moderators Eric Crouch and Sean Robinson, and followed by summarized answers from participants. I am Olugbenga Sonubi Bashir, from Nigeria and I teach geography. Question 1: What does it mean to make learning meaningful for students? Accessing prior knowledge is so crucial as we teach our students. Take them from where they are and help them to get where they are going. We must open the door to opportunities to develop a love of learning for our students through meaningful activities. Will what I teach them make a difference in their world? Will they be empowered? This are great questions and great steps. Both are important for a classroom that makes learning meaningful for students. They can see where it fits into their life – local or global. Purpose is everything I guess. Meaningful Learning = Real-world connections, i.e. : opportunities for students to explore questions, passions for shared stories and experiences. The very reason why students attend school is to learn, and not be taught. Real relevance comes when students are emotionally interacting with learning and using it to impact their world. It doesn’t come from something a teacher or other adult tells them, nor from arbitrary measures like grades. It comes from within, because it matters to them. The moment when you didn’t make your goal, but that won’t stop students from trying again and again. Making learning meaningful requires a lot of student choice and student voice. It is where students are given opportunities to seek out what is meaningful to them and take action on it. Students need to feel some control over where we’re going. Students’ choice and voices are critical. They have passion for projects that are not mandatory, flexible seating so they have low anxiety. Voices of students need to be woven in throughout the what of our work. If you give context and value to content then you provide reasons for empathy. Value is a huge factor. We have to reflect on where students find value and how we can do stuff in the classroom to meet those values. Meaningful-learning moments are filled with joy, passion, and excitement. You literally can’t stop yourself from smiling or in this case, dancing. Why can’t our classrooms be places of joy? It should be a priority. Making learning meaningful is what teaching is all about and is why I became a teacher. It’s about giving students the steering wheel and the keys to their learning and supporting them along the way. Question 2: How do repeated global connections build empathy in our students? Empathy comes naturally. The more time you spend with some people, the more you know them; the more we see, the more we understand; the more we care, the more we feel and the more we want to make right and help. Global connections builds friendships between students from very different backgrounds. They penpal each other, they read with each other, they even send gifts in care packages. They are real friends with deep connections. As teachers facilitate meaningful conversations among students, mutual understanding can occur. When those convos cross national & cultural boundaries, students develop a pattern of global mutual understanding: recognizing similarities, accepting differences. When you truly get to know someone it is pretty difficult to hate them. Q3: How can we form class partnerships to create more opportunities for students? Sincere intension: Start with the WHY and the rest will fall into place. Build the trust within your immediate classroom with sharing their stories and experiences. Like anything else in teaching, class connections need to be intentional. Everything with a purpose. It takes creativity in planning, critical thinking and collaboration with other teachers to do this. Connect: Expand it out to other classroom connections forming global relationships. We should think of ways technology can open windows and doors to learn alongside others. Empatico is a great way to connect your classroom to other classes around the world. You can surely align what you are teaching to a mini lesson already on Empatico Platform. Teaching empathy is a bonus. We build lasting and meaningful relationships with teachers and students from around the world on Empatico. It changes who we are and how we feel. We bond over what we have in common & we are captivated by what is different. Skype Classroom, Flipgrid, Seesaw, padlet and Google For Education allows us to have a focus on a topic with classes around the world. It’s important for teachers to reach outside their classroom and connect with others while still focusing on the learning. It deepens learning when students can talk about what they’re learning. Impact: Use class partnerships to inspire change. What do you love about your school culture? What would you love to learn about another class’ culture? The other school has a student cafeteria? A school garden? Ask for their advice for setting it up. Pedagogy and Technology need to be in balance. Building kids mastery and automaticity with necessary content is something we can’t forget as we develop a class of connection. The connectivity is important. Involve the parents so there would be a well rounded level of understanding that supports the children in their education journey. Definitely, one way to involve parents is to encourage them to comment on student digital portfolios. I love seeing the dialogue of learning between parent and child. Question 4: In what areas have you seen students develop when they have connected outside the class? Communication and social skills develop. There is more purpose in whatever they do. They are more curious. Self directing themselves to resources where they can learn more about things. They show leadership skills too in organizing events, networking etc. I love how these collaborations lead to initiative taking by the students. Students problem solving technological issues together. Lots of learning opportunities along the way. Need to be persistent rather than avoid when tech. doesn’t work perfectly. We foster students’ curiosities when we globally connect. They develop compare/contrast skills, are able to speak with decorum & have meaningful discussions, analyze & interpret data/statistics, have a better sense of self and realize they’re not alone. The age of “us” and “them” is ending. A global citizen identifies, first and foremost, not as a member of a tribe or nation but as a member of the human family. Students who connect across borders and boundaries are understanding this Truth — and sharing it. As long as we teach kids to be thinkers and problem-solvers, they will succeed at whatever jobs the future brings. Thanks to all who contributed to the #SparkEmpathy chat. We hope that you got some new ideas for your classroom and a little inspiration. Thanks, Eric Crouch and Sean Robinson for moderating. Make sure to connect and follow those you learned with. Enjoy!!! Our governments have a plan to save our planet…it’s our job to make sure they stick to it. The Global Goals are only going to work if we fight for them and you can’t fight for your rights if you don’t know what they are. We believe the Goals are only going to be completed if we can make them famous. 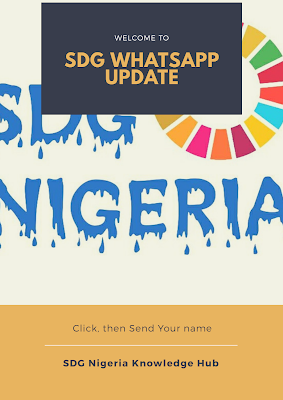 © 2019, SDG Nigeria Knowledge Hub. Excerpts may only be used appropriate acsdemic citation and a link back to the corresponding article/page used.